To encourage the growth and development of youth volleyball (ages 8-14) in the greater Chicagoland area, the Great Lakes Center Youth Academy, Chicago Elite Youth Academy, Energy VBC and Rolling Thunder VBC partnered together to form the Mizuno Youth Grand Prix Series. 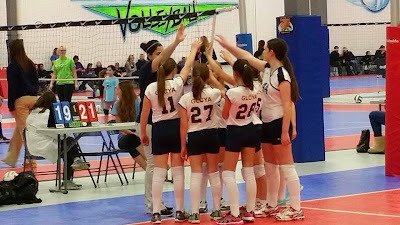 This tournament series runs from the fall until the late spring and was formed to offer a low cost option for young athletes to enjoy the sport of volleyball. Tournament cost is $125 for grades 5-8 and $50 for grades 3-4 (teams play 4 vs. 4 on a smaller court). The MGPYA series has about 10-12 clubs that are currently involved with their youth academy teams. Many of the dates had 40 or more teams entered. The cost is $125.00 for 3 matches/6 sets for Level 2. The cost for Level 1 is $50.00 and they play 4 - 20 minute games so they are done in 2 hours. Cheryl Butler, Director of the Great Lakes Center Youth Academy said "It's been a great first year and has exceeded everything that we hoped it would be. We has a total of 19 play dates with over 700 teams playing in those 19 dates." To keep cost down, older players do the officiating and the teams compete in a power pool so they play 3 matches and get to go home rather than be at the gym for 8 hours or more. The club hosting the Mizuno Grand Prix tournament has their high school girls/boys officiate for $10.00 per match. One parent from each team playing keeps the score. We use a very simple score sheet so parents can do it and then the other parent does the flip score. For the youngest levels (grades 3-4) we play 4 vs. 4 on a 6 meter court using timed games so the teams are not in the gym longer than a couple of hours. Everyone seems to love the format and the feedback has been great. In addition to competition teams practice 1-2 days per week. 3-7 years of age practice 1 day per week for 1 hour. Sports Performance offers 6 week sessions. Level 1 (3rd and 4th grade) practices 1 or 2 days per week for 1.5 hours. Sports Performance offers 10 weeks sessions. Level 2 (5th and 6th grade) practices 1 or 2 days per week for 2 hours. Sports Performance offers fall, club, winter and spring sessions. Everyone plays every position for Level 1 which is 4 on 4. Everyone plays every position for Level 2 and teams run a 4-2 with the RF player setting. In Level 1 Sports Performance has teams of 5 so when the RF player goes back to serve he/she steps out and the team continues to rotate that way. coaches have to make sure that at the end of the day every player has played the same amount of sets. "We hope more clubs will start youth academies and enter the events and those clubs currently involved are hoping to see growth within their Youth Academies which means more teams from those clubs." Sports Performance, Chicago Elite, Energy VBC and Rolling Thunder VBC are all member clubs of the JVA. For more information about the JVA click here.